For hundreds of Maltese runners, the Malta Marathon has become an annual appointment with a sport they love. For hundreds more it has been the inspiration to pick up running shoes and go out running. Only one man, however, can claim to have been there from the start and that man is Charles Darmanin. As the runners line up at the starting point next Sunday, Darmanin will be doing so for the 27th time and if he crosses the finishing line in Sliema he will become the only one to have successfully completed all editions of the Malta Marathon. Others were there with him 27 years ago and have continued running but he is the only one who is still doing the full marathon. The longest serving active athlete at St. Patrick's Athletic Club, Darmanin’s first race for the club was way back in 1964 as a 9 year old. Some feat, considering that the club itself – the oldest in Malta – will be celebrating the 50th anniversary from its foundation by Fr. Michael O’Meara in 1962. Charles remembers the first two editions of the Malta marathon quite well. At the time, running such long distances was a novelty for Malta and it wasn’t easy to know how to properly prepare for it. "I was in London a few weeks before and got pair of ‘Dunlop’ branded shoes for that first marathon,” he recalls. “I thought ‘if the name was a good brand for Car Tyres then it must be also be good for running’. How wrong I was! My feet ached for weeks after the event". 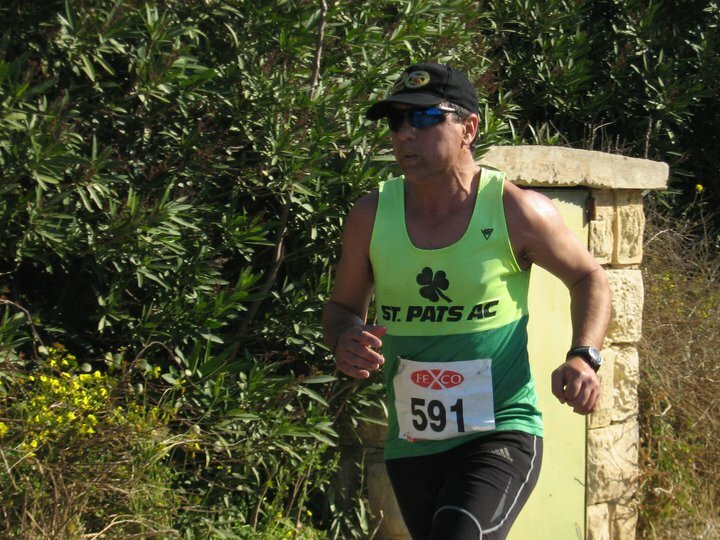 In 1990 took part in the first Malta International Challenge Marathon, another event that he has completed every year since whilst a year later Charles and his wife Antoinette became the first Maltese couple to complete the Malta Marathon. In 1993, after 7 self-coached Malta Marathons he set the 2hrs 58mins time that is considered a bench mark time for the marathon. The following year he improved his time in the marathon to 2hrs 56. Then at the age of 40 in 1995 he did his best time ever in the marathon of 2hrs. 51min. That year he also became a qualified coach for the International Athletic Federation and started coaching a number of athletes in long distance running. Also in 1995 he completed the only 100krun that ever took place in Malta and did a personal best of 36min 18 sec in a 10 k race. For Charles his best experiences came when he sacrificed his time in order to run and encourage the athletes he was coaching. The worst experience, on the other hand, was when he came near to not completing the marathon three years ago when he had cartilage pains in his knee. Another time, in the 5th marathon, he pulled a leg muscle on the 21st mile but again he managed to jog to the finish line. In the 2003 marathon he was guiding and running with six first time marathon runners. The toughest challenge for him was to keep the group together so he made them stop at fixed points to relieve themselves, since it would have been very difficult for someone to make up lost ground if one lost a couple of minutes. At the seventh mile a young English lady who was keeping pace right behind them and when they approached their pre planned 'pit stop' they made a sharp left turn into a side path with the lady following suit. "Obviously we all stopped in a line to take care of our business and for a few seconds this lady just stood there before she realised what we were up to. She turned red in the face laughed out loud and turned back to continue her race". It is a phrase that he recounts to all the athletes he coaches along with a quote by the late Dr. George Sheehan ‘winning is never having to say I quit’. "Nowhere is that truer than in running a marathon, where you win simply by not giving up on yourself," Charles adds. As someone who has been there every year, he’s the living example of that philosophy. This article originally appeared on the Times of Malta edition of Friday, 24th February 2012.